LeBron James has been on an absolute tear. If not for a meaningless 3-point attempt at the end of the game against OKC last Wednesday, his streak of scoring 30 or more points while shooting 60% or better would not have been broken. The only question now is for how long will he be able to maintain that insane level of efficiency? The Celtics recently lost Rajon Rondo, Jared Sullinger, and Leandro Barbosa to season-ending injuries. Somehow, they have won eight of their last 10 games. I have no idea how they do it, but they seem to get better as they get more depleted. Can they keep it up, though? Howard recently told the media that Lakers GM Mitch Kupchak assured him he won’t be traded. Let’s wait and see. We have seen more updates about Andrew Bynum’s hair than his progress from knee injuries. The clock is ticking for the big man. Can he actually get healthy enough to play basketball for the Philidelphia 76ers? Several teams, including the Dallas Mavericks, the Brooklyn Nets, and the Washington Wizards, are reportedly interested in trading for Josh Smith. Hawks management seems hell-bent on clearing up its books. Smith is effective but overpaid. He’ll probably be somewhere else by February 21. If we’re going to go by recent comments made by Rose himself, then we’re probably not going to see him play this year. That’s probably better for is long-term outlook. Here’s to hoping he gets back all of his pre-injury explosivenes. The Mavs currently have a 23-29 record and sit at 11th place in the West. Dirk Nowitzki and his teammates have vowed not to shave their beards until they get back to .500. Do they have enough in those old legs to get there? The Miami Heat have not exactly played well throughout this season, yet they still have the best record in the East. Can anybody actually give them a good fight, or will they just run roughshod over everyone en route to another Finals appearance? The Knicks may be too old, and the Pacers probably need another shooter. Rudy Gay was the only Grizzly who could create his own shot, which is why Memphis ran most of their offense from the post either through Zach Randolph or Marc Gasol. With Gay now in Toronto, what happens to Memphis’ offense? Will it become more fluid without Gay’s ball-stopping habits, or will they miss his ability to get his shot off even when under pressure? Paul George has been great this season. Will he still be as effective when Danny Granger eventually returns? Will Granger now defer to George (who is already better than Granger ever was)? We’ve known for years that seeding doesn’t matter as much as health for the San Antonio Spurs. This is why Gregg Popovich regularly rests his veterans at strategic points in the season. Of course, it has sometimes resulted in the Spurs giving away games in the regular season, but it hasn’t really come back to bite them yet. It would be interesting to see if Pop goes for the top seed this year considering that the West’s bottom-seeded team this year will probably be the weakest it has been in a long time. If at the beginning of the season, you said Brook Lopez would be Brooklyn’s best player, I would have laughed at you. Yet here we are. Deron Williams, after signing his max deal, has had a terrible season. Remember when people were debating who was better between Deron and Chris Paul? Those days seem so long ago. Deron will really have to turn it on for the Nets. The Knicks have relied on a lot of veterans to get them to where they are right now, which is second place in the East. The question now is whether those veterans can sustain their level of play. Will they have anything left for the postseason? The paperwork has been filed for the Kings’ relocation to Seattle. Sacramento Mayor and former NBA All-Star Kevin Johnson wants one more shot at keeping the Kings in his city. What will Clay Bennett do? Before Chris Paul’s injury, the Clippers were right up there with the Spurs and Thunder in the battle for the best record in the West. Without CP3, the Clips sputtered. Now that he’s back, we can again ask what the ceiling is for this team. Those are just some of the interesting storylines that I believe are worth watching once the regular season resumes tomorrow. As always, the march to the NBA Playoffs should be a lot of fun. 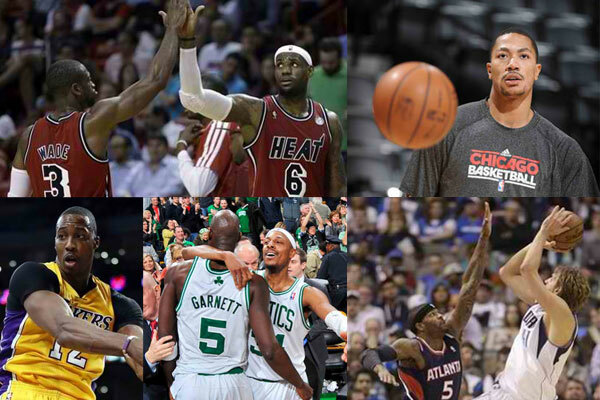 It will really be interesting to see how the rest of the East competes against the Heat heading into the Playoffs. The Heat’s just looking like a real juggernaut at this point. The West figures to be more wide-open this year, but the Clippers really look strong. I’m really not sold on the Knicks. It’s really only Indiana that I can see who can give Miami fits mainly because of their size. As for the West, the top four look really solid.